The Graduate Research Forum, a part of the Student Research Week, features poster displays and oral presentations representing UCF graduate students from diverse disciplines. The Research Forum is an opportunity for students to showcase their research and creative projects and to receive valuable feedback from judges. Awards will be provided for presentations deemed exemplary. Participants must be UCF graduate students enrolled in the spring 2019 term. Projects submitted must be research conducted as part of a UCF graduate program or class supervised by UCF faculty/instructors. Participants will need to select the presentation format when submitting their abstract and can only present in one format (oral or poster) per year. Once abstracts are submitted students cannot change presentation format. While papers may have previously been presented or published, the submission should be the original work of the author. If the presented paper is a result of a collaborative student-faculty project, it is expected that the majority of the research to be presented was completed by the graduate student. Only one presenter is allowed for oral presentations, however, additional co-authorships are to be permitted for poster presentations. Only the primary author will be recognized in the event program and for award purposes. The author licenses the University of Central Florida to publish the paper in the Graduate Research Forum Proceedings and elsewhere as the university deems appropriate. The author retains copyright and retains the non-exclusive right to publish or license this article or any derivative. Author warrants that he or she has the right under the Copyright Act to grant this license to the University of Central Florida and that no other person has rights in this article which are inconsistent with the author’s power to give this license and this warranty. Note: If papers have previously been published, it is the author’s responsibility to ensure republication is permitted and to properly document previous publications according to the requirements of the original publisher. Scholars often present their work before their projects are complete. If you are working on a project for a class, you may not have your final results or final product by early April when the Forum will take place. If you have any preliminary results, use them as examples of the kind of results you hope to obtain. Discuss the significance of these results. If you don’t have any preliminary results, you can focus on projected results: what do you think you might find when your results are complete? Whether you have complete, partial, or only projected results, keep in mind that your explanation of those results—their significance—is more important than the raw results themselves. A poster presentation is a graphically oriented summary of your research project. It consists of a collection of frames, displayed at eye-level on one side of a freestanding double-sided whiteboard. Posters will be displayed on whiteboards with magnets (provided the day of the event). Posters must be no larger than 48″ wide x 36″ tall in order to fit on the whiteboard. 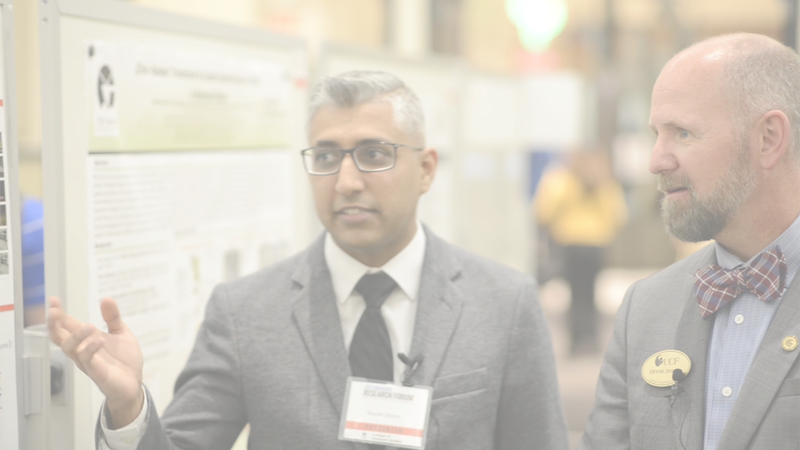 Presenters will need to submit a PDF of their poster to the submission site by March 25, 2019. Students should only bring their printed out poster the day of the event. All presentation information should be on your poster, as there will be no available space in front of your poster for displaying items. Your title should be appropriate for a general academic audience; make it interesting and informative. The poster presentation should be self-contained and complete without additional oral explanation. Judging will be based on the setup and visual appeal, clarity of your introduction, organizational flow, conclusion statements, audience analysis, and convincing proof of research potential and world relevance. During the specified judging times at the Graduate Research Forum, the presenting author will be required to be at their poster station and authors should be prepared to explain their presented work. Title: Include a banner frame clearly stating the title of the poster. Abstract: Display your abstract on one frame, accompanied by your name and department on one frame. Clearly articulate what you did, how you did it, why you did it, and what it contributes to your field and the larger field of human knowledge. Introduction: Specify the main argument of your study, provide an overview of what you did, the evidence that supports that argument, and point out the significance and value of the research. Be succinct in this one-frame element. Method: Use at least one frame to present how you conducted your project. Results: Indicate what your research has revealed. Conclusion: Include an explanation of the ways the results satisfy the research objective. Illustrate how your findings impact scholars in your field and members of the broader intellectual community. Students are required to print their own poster. The College of Graduate Studies does not provide printing services. However, some departments do have large-format printers, so inquire with your program for details. Remember, a PDF of your designed poster will be required to be submitted by March 25, 2019. It is highly suggested that you have your poster submitted for printing well before that date. Printed from your PowerPoint or PDF file. You must account for shipment time. Convert your file to a PDF. Choose “Upload Your Own Design”, Banner Size should be 3’ by 4’, Orientation is ‘Landscape’. Before you confirm you will be able to preview it. Be careful of your margins because things too close to the edge will be cut off, as you will see in the preview. If this happens, you will need to go back to your PPT slide to adjust it and then convert it to a PDF. There will not be a PowerPoint slide limit, but it is highly suggested that presenter limit their presentations to 5-7 slides. No animation or video will be allowed. File format must be PowerPoint. Presenters will have 10 minutes for their presentations. The presenter must be able to communicate their research to the audience within this 10-minute allotment. Presenters will need to submit their static PowerPoint slides to the submission site by March 25, 2019. There will be no co-authors allowed for the oral presentations, as the judging will be based heavily on the communication of the research. Your PowerPoint slides will be pre-loaded on a laptop the day of the event and no changes can be made at the event. Oral presentations are not eligible for the statewide research forum. All Pathways to Success workshops are held in the Graduate Student Center located in Trevor Colbourn Hall, suite 213. Register for Pathways to Success workshops through your myUCF Student Center under Graduate Students then Pathways to Success. For full workshop details, please see the Workshops Descriptions on the page.